Many of our clients come to us with damaged artwork or frames. Cleeve Picture Framing offer a full restoration service. Most art can be improved quite dramatically and clients are amazed at the results we achieve. 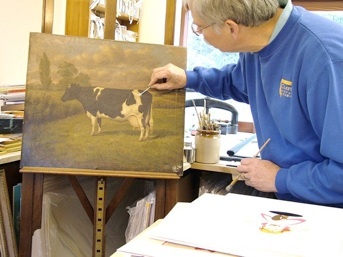 If you have a piece of art that would benefit from restoration, no matter how minor, bring it to the workshops where one of our experts can evaluate the work required and give you an honest opinion. Ultraviolet light can be highly damaging to sensitive pictures. Not only do ultra violet rays fade printed works, watercolours and oils, it can also degrade the paper or canvas they are on. We offer 99% U.V. filter glass to help protect precious pictures. We would advise not to hang pictures in direct, or bright indirect, sunlight. Also, U.V. rays are found in artificial light sources; ordinary incandescent light bulbs are safer than halogen or fluorescent bulbs. Temperature, humidity and airborne pollutants can also affect artworks, so our careful framing and mounting using acid-free materials will help to alleviate these potential problems. We stock different types of glass for all situations including clear, non-reflective, U.V., museum, and Perspex. 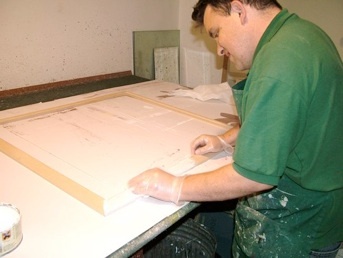 Our framing is all carefully done by craftsmen who ensure that the frames and mounts are made to a high standard that ensures the art work will be in a protected and safe environment.